While the rest of the world celebrated Christmas and all good things, you get to take upon yourself the epic fight with the Dark Lord. 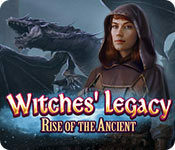 Elefun Games have recently released a new addition to the Witches' Legacy series, Witches' Legacy: Rise of the Ancient Collector's Edition. The fight is not over and you need to awaken to bring it to the end. The game employs this dark story to its full potential with the help of the graphics and sounds. For those who have not followed the story through the previous games, Ezar is the Dark Lord who has been quite a pain for the witches. It seemed that the last battle was the last one, but no, he has arisen and up to no good again. The witches live in the same world with people and Ezar is from the world of demons. There is a Tree of Life that balances the two worlds and the portal between them. Ezar is trying to break through the portal and enslave both witches and people to himself and fill their world with darkness. The game employs this dark story to its full potential with the help of the graphics and sounds. You will not see any cute details or characters in the scenes and the voices of some of the characters will make you shiver. You get the map as you play and the strategy guide is available to you. 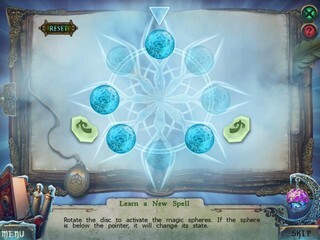 Some of the parts of the game, like puzzles and hidden object scenes, sometimes become more challenging. You can adjust the skip option for that, too. There are no helpers in the game except for a falcon that you use once and never see again. 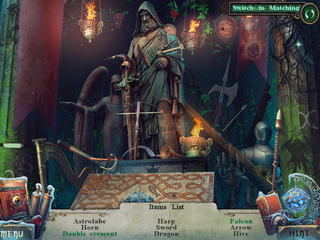 There are 21 hidden object scenes in this game. If you are not a fan of hidden object scenes, you can play a match-three instead of them every single time. They are all the types of searches you have seen before. A lot of storybook ones with words in bold. There is a unique one where you are times as you dive underwater. There are 32 monster footprints to collect, 31 morphing objects to find, and 12 achievements to earn. The game features a bonus chapter and a lot of media extras to enjoy after the game. 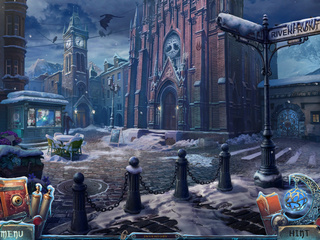 Take a step away from the Christmas cheer into a creepy and dark hidden object puzzle adventure game! This is Witches' Legacy: Rise of the Ancient review. Download this game here.